Canadian Internet Policy and Public Interest Clinic blackout protest page January 18, 2012. The Internet is a major source of innovation for both the economy and society. It enables entirely new forms of business, communication, and knowledge and plays a central role in changing repressive societies, creating global awareness, and forging relationships. The Internet provides us with a set of online freedoms. It’s fascinating (and in many cases disturbing) to see governments attempt to modernize legislation from pre-Internet days and in some cases introduce new legislation seeking to leverage the Internet or control it. Yesterday, January 18, 2012 many of you may have experienced “blackout protests” when thousands of websites went dark in protest against two draft anti-piracy and counterfeiting bills in the US Congress. I thought I’d try and make sense of these protests. What are these bills all about? Why are legislators bringing them forward? Why are people protesting? How does it affect Canada? Is there similar legislation being brought forward in Canada? How does it affect me? At this juncture in the evolution of the Internet rather than embracing the innovations the Internet is bringing many legislators seem intent on curbing it. In the US two draft anti-piracy and counterfeiting bills are currently being reviewed in the US Congress. 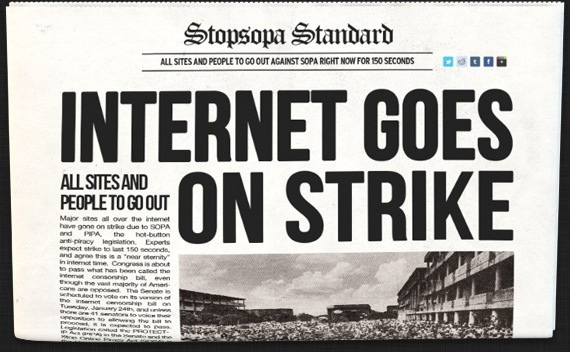 The Stop Online Piracy Act (SOPA) and the Protect IP Act (PIPA). SOPA is intended to fight online trafficking in copyrighted intellectual property and counterfeit goods. PIPA is intended to give the US government and copyright holders tools to curb access to “rogue websites dedicated to infringing or counterfeit goods”, especially those registered outside the U.S. These bills are in response to the perceived problem that piracy is having a large negative impact on US content industries. 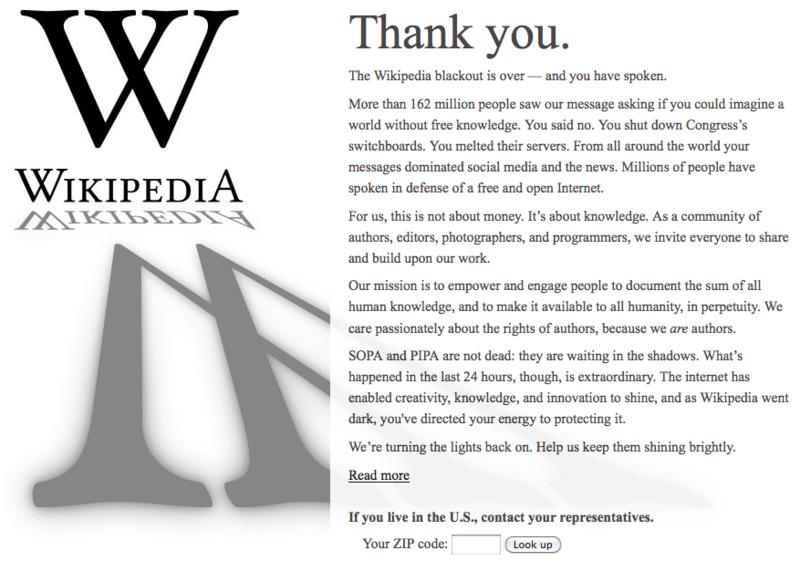 It’s interesting to compare the list of those supporting SOPA with those opposing SOPA. Supporters of SOPA represent the movie, music and publishing industries while those opposed are primarily from the technology, public interest, and human rights groups. These lists themselves are interesting as they establish a kind of public transparency and accountability for what is happening. legislation of this kind requires precise and technologically savvy language. See A technical examination of SOPA and PROTECT IP for an analysis of this perspective. 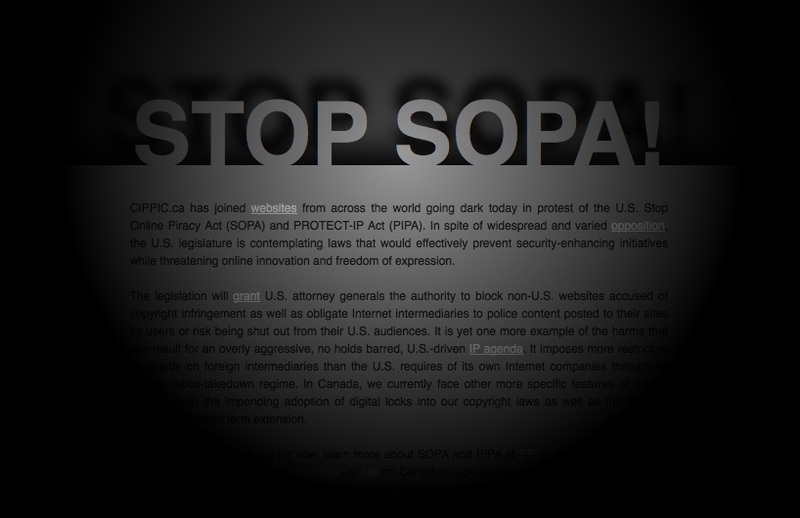 SOPA and PIPA are not the only contentious bills. There is also the Research Works Act. In the US the National Institutes of Health (NIH) has a policy that ensures that the public has access to the published results of NIH publicly funded research. The Research Works Act seeks to prevent NIH and any federal agency from adopting such open access policies. See Anti-Open Access Rises Again and Academic publishers have become the enemies of science. I find it disturbing that with all these legislative bills the economic benefits of a few are superceding the public benefits of many. These bills seek to control and limit freedom as is so eloquently expressed in my colleague Scott Leslie’s Short Poem About SOPA. But for me its not just about control and freedom its about optimizing the use of technology. Much of what I see happening is seeking to break or disable technology in order to enforce old business models. I’m dismayed when I see technologies hobbled for economic gain. See Publishers vs. Libraries: An E-Book Tug of War for example. When David Wong says in his brilliantly funny 5 Reasons The Future Will Be Ruled By B.S. that “The future is going to hang on whether or not businesses will be able to convince you to pay money for things you can otherwise get for free.” I’m really hoping he’s wrong. In the digital world the incremental cost of distributing digital goods is next to zero. Creating business models based on artificial scarcity is sheer folly and fails to leverage the innovation that technology and the Internet bring. If we truly are interested in improving our economies and societies we’d be well served to focus on how we incentivize the production and use of creative works not curtail them. We’d be better off looking at how we maximize access and use not limit it.